It’s a bird, it’s a plane…no, it’s an unmanned aerial vehicle (UAV) commonly known as a drone! Though drones were initially conceived and have been used as a part of modern warfare in the past, they are now increasingly being looked at by businesses to reduce costs, save time and improve customer service.In fact, one of the world’s largest companies, Amazon, is their most famous use-case through its recent public testing of drones with Amazon Air. And given its global influence, it’s no wonder Amazon forced other companies to stand up and take note of the potential uses of drones within businesses. Regardless, many companies have already been looking into the technology and are already testing drones and using them, albeit in a limited manner. More recently, the buzz around drones has been (due to Amazon) around delivery, wherein customers are delivered products and goods via drones. However, though they can be used in delivering food, small items and products, drones can also be used within development, recovery, and search and rescue missions. Given that there is potential for drones within development, reconstruction, and retail, it is also true that drones can have a huge and untapped potential within the logistics sector. In fact, as per a new market research report Drone Logistics and Transportation Market by Solution (Warehousing, Shipping, Infrastructure, Software), Sector (Commercial, Military), Drone (Freight Drones, Passenger Drones, Ambulance Drones), and Region – Global Forecast to 2027, “the market is estimated to reach USD 11.20 Billion in 2022 and is projected to reach USD 29.06 Billion by 2027, at a CAGR of 21.01% from 2022 to 2027.” Thus, with such impressive growth figures predicted it is no wonder more players within the logistics sector are closely examining the future potential of drones. As earlier mentioned, drones were first associated with the military for intelligence, anti-aircraft, and target practice. However, they now are more commonly used by civilians recreationally, by cinematographers in film, for weather monitoring, agriculture, surveillance, and even traffic assessment. Within logistics and distribution there are two main types of drone delivery being explored – home drone delivery and supply chain delivery. Home drone delivery in more popular though supply chain delivery can be very important in saving time, costs and streamlining processes. For warehouses, drones can be used to “randomize picking routes.” In order to improve utilization within warehouses, and where there aren’t fixed palletizers, by changing the “programming of aerial drones, pallets can be set-up as and when required.” Drones can also help replace conveyor systems in places where there are configuration problems. Given the vast amounts of stock and inventory within the logistics sector, there is potential for drones to work as possible alternatives to trucks or other surface transport options. Here, they could be deployed between warehouses to ensure demand within a local or regional area is met and to balance and manage inventory levels. One of the biggest issues facing businesses is claims/returns. Here, drones could be used to pick-up faulty products from customers and drop them to be replaced/fixed. Large retailers could benefit from having their logistics save time given the benefits of no road traffic or congestion as well as reduce efforts of human labor and save on fuel prices. Going further, there is also scope for end customers within a limited and finite range to be served by drones. However, given the current restrictions on weight and package type only certain goods can be transported. Nevertheless there is still an untapped potential for companies looking at the last mile (when a package reaches a customer’s door) delivery and can help remove the need for humans, reduce cost of transport, labor, and save time. Also, within a warehouses drones can help with safety issues such as being able to reach places where employees may face danger or accidents. In the event an accident has taken place drones can be sent to take pictures of accident-prone sites or, where there is a problem, can be deployed to help review/solve problems. Further, as has been mentioned, there is even greater scope for drones to “offer the potential to increase flexibility and combine the speed of automated handling equipment with the scalability of a manual warehouse workforce.” Thus, a combination of a human-drone workforce can greatly improve efficiencies with warehouses. This can also be complemented by RFID-reading drones, which can “pinpoint and count tagged inventory stowed inside stand-trailers, making them invaluable for large distribution centers with outdoor goods-yards,” saving precious time and costs. In terms of the future, there is a great deal of potential for drones to be used within the logistics sector. However, one of the biggest hurdles is their limited weight. At present, packages weighing more than 5 kg are hard to hold and there is a risk attached to them. For now, larger drones are more expensive and need more testing. Given this their range is also limited as is their speed and they can only embark on short trips. There is also the issue of government regulation and the need for several licenses and procedures to be followed for commercial usage of drones. Here there are several grey areas and issues of security, surveillance, safety and risk need to be addressed. Thus, at present, only large players such as Amazon, Walmart, DHL, and UPS (among others) are actively using drones. 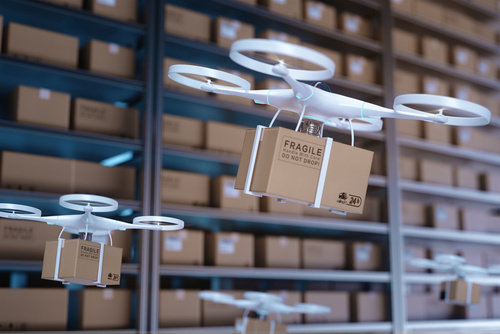 However, given the rapid pace of technology, innovation by businesses, and competition for increased customer loyalty, the future looks bright and it seems only a matter of time before drones, as part of the technology revolution, which includes AI, robotics, IoT, etc., will enter the mainstream and will inevitably become commonplace within the logistics sector.